The Reclaiming Vacant Properties conference runs today through Friday in Cleveland, Ohio. As part of my scholarship responsibilities, I will be blogging about the conference - I hope to come away with some practical ideas for neighborhood revitalization in Des Moines. My sessions don't start until this afternoon, so I am taking the morning to accomplish a little bit of work. Pedestrian-Friendly Street in Cleveland HeightsI'm staying with some friends in the suburb of Cleveland Heights, adjacent to Case Western Reserve University. In some ways, this area is very much like my own Drake neighborhood in Des Moines. At the end of the street is a small commercial district with a variety of shops (including the Starbucks in which I sit). 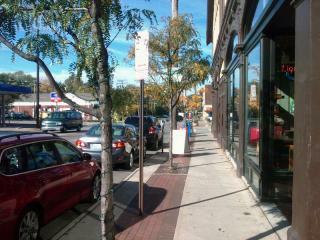 Street parking separates the sidewalk from the relatively busy street. 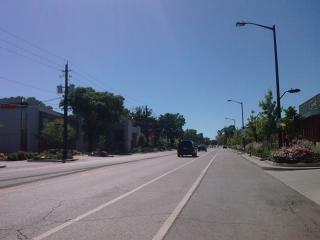 A regular row of trees helps define the dedicated pedestrian area. Brick pavers create an area between the cars and the walking path for amenities like newspaper vending and business signage. Buildings are built right up to the sidewalk creating a defined edge. Each retail space has a large storefront window. These are all simple and relatively inexpensive things to do - they don't require major infrastructure improvement, and relatively minimal ongoing maintenance. And they work. Most of the people in the coffee shop right now appear to have walked here from the surrounding neighborhood. If we create nice places to be, close to the places we live, and comfortable paths to get there, people take advantage of the opportunity. Glad you're attending the conference, which is where I'd like to be right now. I just wanted to add for the uninitiated that it's possible that these street improvements actually could be quite expensive, depending on circumstances. If you're moving the curbline and therefore the storm drainage system, installing trees where there were none before, or removing existing sidewalk to install pavers, this could be pricey. It's easy to blow a million or two in a block or two. So, in simple home maintenance kinds of terms, if you start moving the plumbing around, get ready to face some significant cost. But this is a pretty streetscape. Thanks for reading and commenting! The conference has been a great experience so far, and I'm coming away with a lot of great ideas for projects I'd like to implement... probably too many ideas. Regarding cost, you are right - infrastructure changes cost. In my own mind, I was referencing relative expense in relation to the Ingersoll streetscape improvements recently undertaken in Des Moines. In my opinion the raised planters and landscaping are over-the-top... perhaps even to the extent of detracting from the overall viability of the corridor as a pedestrian commercial district. Indeed at the height of the spring/summer growing season, it is difficult for people in cars to see the businesses beyond. That's really just a long way of saying, I intended to compare the relative simplicity of the Cleveland image to the relative complexity of what we did in Des Moines and make the point that in my mind, simplicity wins.